What Distributors Want… SSWA Wholesalers Deliver! SSWA Wholesalers are uniquely positioned to provide great value to both manufacturers and distributors. -->Click here to learn how! Get your products to market faster and more efficiently with the use of Wholesalers, while managing high-cost-to-serve customer orders and reducing credit risk. Achieve faster inventory turns, shorter lead times, more frequent deliveries, and improved fill-rate economics without the hassle of high minimums from manufacturers causing bloated inventory. The Sanitary Supply Wholesaling Association has been a leading professional association for wholesalers and manufacturers of cleaning and maintenance products since 1980. A Guide for Manufacturers, Distributors, and Wholesalers in the Sanitary Supply Industry. Redistribution of sanitary supply products has evolved to the point that most channel manufacturers and distributors recognize its value. 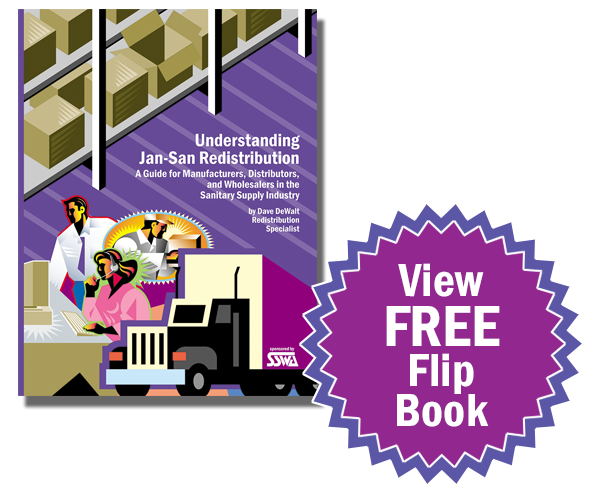 Many Jan-San distributors, both large and small, purchase from wholesalers; and many manufacturers are taking advantage of the benefits offered by wholesalers.